Johann Lukas von Hildebrandt was born in Genoa (Italy) in 1668 and studied to become an architect in the workshop of Carlo Fontana in Rome. During his studies, he became familiar with the round and flowing shapes of Italian Baroque, which he later developed into an own, characteristic style. He soon had an international reputation for his skills and in 1701, he became "Kaiserlicher Hofingenieur" ("Imperial Court Engineer") in Vienna. At the same time, Johann Bernhard Fischer von Erlach was the "Erster Hofbaumeister" ("Principal Court Builder") and became his long-term rival. Nevertheless, there are several important buildings for which both of Austria′s grand masters of Baroque architecture contributed designs. This includes the Winterpalais Palace of Prince Eugen. In 1720, Hildebrandt was knighted (after von Erlach had been the first artist ever to be knighted); after von Erlach′s death in 1723, von Hildebrandt was promoted to succeed him as Erster Hofbaumeister. The style of Johann Lukas von Hildebrandt is famous for round shapes, the heavy ornaments and decorations as well as a high degree of lightness: Roofs, windows and curved lines are arranged into highly harmonic buildings. 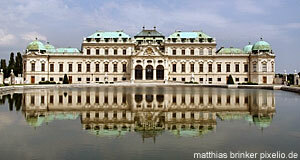 The most famous of them is the Schloss Belvedere Palace in Vienna. Comparing the Belvedere with Fischer von Erlach′s palatial designs (such as those for the Hofburg, Schloss Schönbrunn or the Hofstallungen (today′s MuseumsQuartier), one can see an obvious difference, despite of the basic elements being the same: The individual parts of the palace are distinguishable as units from outside in von Erlach′s designs, whereas von Hildebrandt blends the outside into a single, plastic unit that covers much of the inner structures. This unit is then divided and spiced up with playful details - such as the copper roofs of Schloss Belvedere, which are supposed to resemble the tents of the Turkish army. Johann Lukas von Hildebrandt was tremendously productive and left a very important mark on the architectural heritage of Vienna. His most important works in the capital beyond the Belvedere are the Palais Schwarzenberg; the Garden Palais Schönborn; the Palais Daun-Kinsky; the Piaristenkirche Church Maria Treu; the Peterskirche Church; the "Geheime Hofkanzlei" (today′s Chancellery next to the Hofburg); the Palais Starhemberg-Schönburg; one wing (Reichskanzleitrakt) of the Hofburg; and the Palais Harrach. Outside of Vienna, he designed some of the biggest countryside castles of Central Europe, most importantly the Palace Schlosshof for Prince Eugene, but also the Habsburg′s summer retreat in Laxenburg ("Blauer Hof"), and various smaller palaces, such as Schloss Halbthurn in the Burgenland, the Schloss Schönborn Castle in Lower Austria, the Deutschordenskirche Church in Linz and the monastery of Göttweig - the latter design was never completed, though. Johann Lukas von Hildebrandt died in Vienna in 1745.